This architecturally collaborated remodel incorporates designer materials and sophisticated Smart Home features. 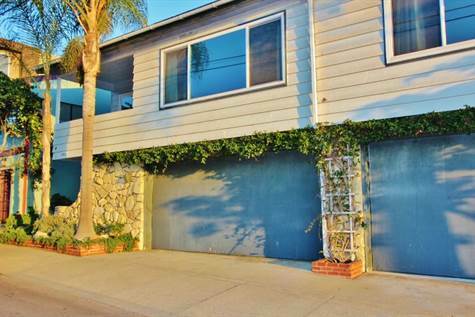 This 2350 sf split-level home nestles on the quiet north side of Playa Del Rey's ocean view hill, above the urban activity of downtown. Inviting ocean and mountain views, lots of natural light and an open, functional floor plan create a blueprint for beach living. Secluded patios, formal dining room and 3 beds + 2 baths (each w/ frameless showers, separate tubs and dual sinks), chef's kitchen with balcony and separate eating area, quartz counter tops, washer/dryer in laundry room, formal entry, large storage and elegant wood floors, wood/gas fireplace, dual pane windows, ethernet are just a few of the highlighted perks. Two-car Private garage with direct access to unit may be included for an additional $355/mo. Walk to the beach, the parks or bike to the Marina, Manhattan Beach and Playa Vista. A hub for freeway access, shopping in Culver City, Marina Del Rey, Playa Vista or Manhattan. This is Silicon Beach.